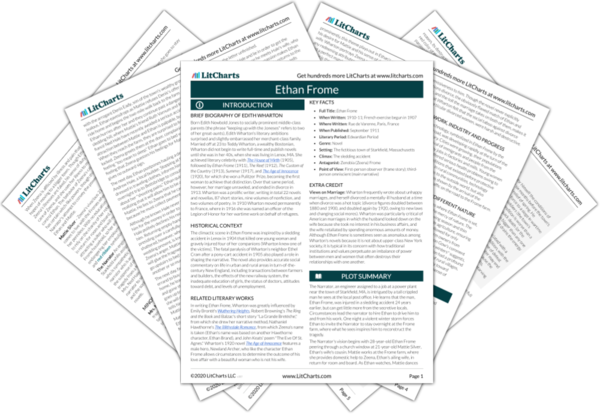 Instant downloads of all 946 LitChart PDFs (including Ethan Frome). 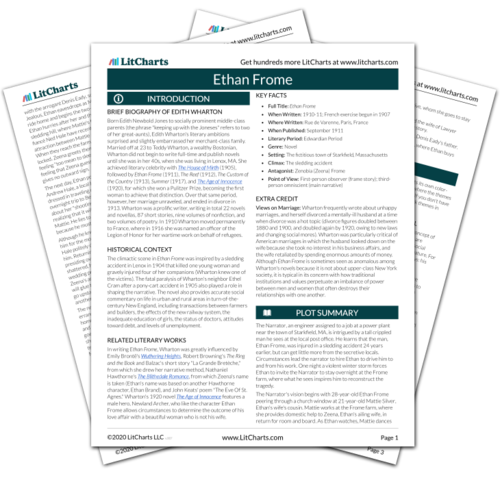 Welcome to the LitCharts study guide on Edith Wharton's Ethan Frome. Created by the original team behind SparkNotes, LitCharts are the world's best literature guides. A concise biography of Edith Wharton plus historical and literary context for Ethan Frome. A quick-reference summary: Ethan Frome on a single page. In-depth summary and analysis of every chapter of Ethan Frome. Visual theme-tracking, too. Explanations, analysis, and visualizations of Ethan Frome's themes. Ethan Frome's important quotes, sortable by theme, character, or chapter. Description, analysis, and timelines for Ethan Frome's characters. Explanations of Ethan Frome's symbols, and tracking of where they appear. An interactive data visualization of Ethan Frome's plot and themes. Born Edith Newbold Jones to socially prominent middle-class parents (the phrase "keeping up with the Joneses" refers to two of her great-aunts), Edith Wharton's literary ambitions surprised and slightly embarrassed her merchant-class family. Married off at 23 to Teddy Wharton, a wealthy Bostonian, Wharton did not begin to write full-time and publish novels until she was in her 40s, when she was living in Lenox, MA. She achieved literary celebrity with The House of Mirth (1905), followed by Ethan Frome (1911), The Reef (1912), The Custom of the Country (1913), Summer (1917), and The Age of Innocence (1920), for which she won a Pulitzer Prize, becoming the first woman to achieve that distinction. Over that same period, however, her marriage unraveled, and ended in divorce in 1913. Wharton was a prolific writer, writing in total 22 novels and novellas, 87 short stories, nine volumes of nonfiction, and two volumes of poetry. In 1910 Wharton moved permanently to France, where in 1916 she was named an officer of the Legion of Honor for her wartime work on behalf of refugees. 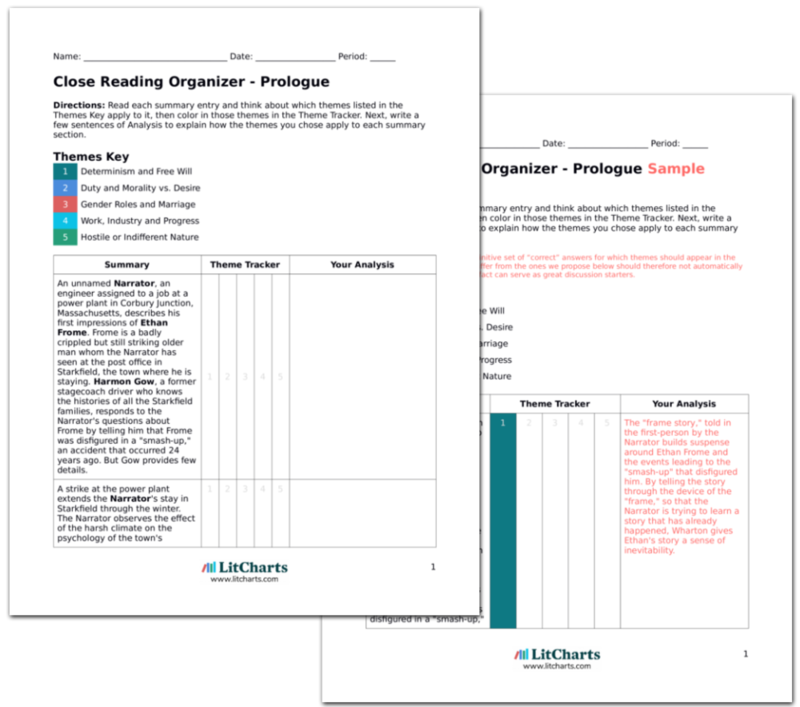 Get the entire Ethan Frome LitChart as a printable PDF. The climactic scene in Ethan Frome was inspired by a sledding accident in Lenox in 1904 that killed one young woman and gravely injured four of her companions (Wharton knew one of the victims). The fatal paralysis of Wharton's neighbor Ethel Cram after a pony-cart accident in 1905 also played a role in shaping the narrative. The novel also provides accurate social commentary on life in urban and rural areas in turn-of-the-century New England, including transactions between farmers and builders, the effects of the new railway system, the inadequate education of girls, the status of doctors, attitudes toward debt, and levels of unemployment. In writing Ethan Frome, Wharton was greatly influenced by Emily Brontë's Wuthering Heights, Robert Browning's The Ring and the Book and Balzac's short story "La Grande Bretèche," from which she drew her narrative method, Nathaniel Hawthorne's The Blithedale Romance, from which Zeena's name is taken (Ethan's name was based on another Hawthorne character, Ethan Brand), and John Keats' poem "The Eve Of St. Agnes." Wharton's 1920 novel The Age of Innocence features a male hero, Newland Archer, who like the character Ethan Frome allows circumstances to determine the outcome of his love affair with a beautiful woman who is not his wife. Views on Marriage: Wharton frequently wrote about unhappy marriages, and herself divorced a mentally-ill husband at a time when divorce was a hot topic (divorce figures doubled between 1880 and 1900, and doubled again by 1920, owing to new laws and changing social mores). Wharton was particularly critical of American marriages in which the husband looked down on the wife because she took no interest in his business affairs, and the wife retaliated by spending enormous amounts of money. Although Ethan Frome is sometimes seen as anomalous among Wharton's novels because it is not about upper-class New York society, it is typical in its concern with how traditional institutions and values perpetuate an imbalance of power between men and women that often destroys their relationships with one another. Celona, Tina. "Ethan Frome." LitCharts. LitCharts LLC, 22 Jul 2013. Web. 13 Nov 2018. Celona, Tina. "Ethan Frome." LitCharts LLC, July 22, 2013. Retrieved November 13, 2018. https://www.litcharts.com/lit/ethan-frome.